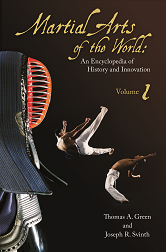 Editors: Green, Thomas A. and Svinth, Joseph R.
Martial Arts of the World comprises 120 entries in two volumes. The first volume is organized geographically to explore the historic development of martial arts styles in Asia, Africa, Europe, and the Americas. The second volume looks at martial arts thematically, with coverage of belief systems, modern martial arts competitions, and a wide range of such topics as folklore, women in martial arts, martial arts and the military, and martial arts and the media. Written by international scholars, includes introduction and bibliographies.